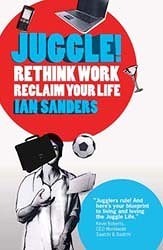 Review of the fantastic book, Juggle: Rethink Work, Reclaim Your Life0inShareEmailJuggle: Rethink Work, Reclaim Your Life by Ian SandersI have recently had the opportunity to read an inspiring book on lifestyle design and the future of work called, Juggle: Rethink Work, Reclaim Your Life. Author Ian Sanders has some great ideas about the some of the biggest career and lifestyle design issues we are all facing. The book is loaded practical examples about how to live a “portfolio lifestyle” including quotes and interviews with Gary Vaynerchuk and Saatchi & Saatchi CEO, Kevin Roberts.